If you are applying to any Universities in Abroad, you need to prove your level efficiency in English to be accepted by those universities. To prove your English Efficiency you can take the most popular English Language Test IELTS. The IELTS (International English Language Testing System) is an international Standardized Test for non-native English Language Speakers to prove English Language Proficiency. It is one of the Major English Test in the world, Apart from other English language tests TOEFL, TOEIC, PTE. The Academic Institutions in Australia, Britan, Canada, New Zealand, over 3000 Academic Institutions in USA, and various professional Organizations across the world accepts this IELTS Score to provide admission in various Graduate and Postgraduate Programs. IELTS is also an important Test for VISA Immigration Process for various Foreign Countries. For UK Visa and Immigration, IELTS is only the Secure English Language Test. It is also an important requirement for immigration to Australia and New Zealand. The IELTS Test assesses the listening, reading, writing, and speaking skills of a student in English. To Measure performance of the Students in IELTS Exam, it uses Band Scores for each language sub-skill (Listening, Reading, Writing, and Speaking). There are no Minimum Marks for passing this Test. All Test Takers will be issued with a Score from “Band 1” to “Band 9″ based on their performance. If the candidate did not attempt the test, The Band 0” Score will be allotted. And the IELTS Test Score is valid for Two years from the Test Date. AT Present, for Australian General Skilled Migration (GSM) applications IELTS Score is valid for three year period. The IELTS English Language Test consists of two modules namely Academic Module and General Training Module. Where the IELTS Academic module is intended for those who want to enroll in higher education programs in universities and other institutions and for professionals such as medical doctors and nurses who want to study or practice in an English-speaking country. And IELTS General Training Module is intended for those who are planning to take non-academic training or to gain work experience, or for immigration purposes. Along with these two modules, there is also a separate test offered by the IELTS test partners namely IELTS Life Skills. This Test is intended for the people who need to their English speaking and listening skills at Common European Framework of Reference for Languages (CEFR) levels A1 or B1. This can be used to apply for a ‘family of a settled person’ visa, indefinite leave to remain or citizenship in the UK. Usually, the IELTS Test consists of four parts namely listening, reading, writing, and speaking. The Test Taker should complete all parts of the test in a total duration of 2 hours 44 minutes. Where the Listening, Reading, and Writing sections can be completed in one sitting and the Speaking test may be taken on the same day or up to seven days before or after the other tests. Usually, all test takers take the same listening and speaking tests, while the reading and writing tests will differ depends on the whether the test taker is taking the Academic or General Training versions of the test. To Take the IELTS Test the candidates are expected to pay around £115 GBP, €190 Euros or $200 USD. But the Fees may from country to country and it is set by test centers. The Listening Module of the IELTS Exam consists of four sections, with ten questions in each section. The total duration of this section is 40 minutes, where 30 minutes for testing, plus 10 for transferring the answers to an answer sheet. Among the four sections, the first two sections are about everyday social situations, which means the Section 1 has a conversation between two speakers (for example, a conversation about travel arrangements) and section 2 has one person speaking (for example, a speech about local facilities). The Section 3 and Section 4 are about educational and training situations. Which means the section 3 is a conversation between two main speakers (for example, a discussion between two university students, perhaps guided by a tutor) and section 4 has one person speaking about an academic subject. The first three sections have a break in the middle of the test to allow test takers to look at the remaining questions. Each section is heard only once. 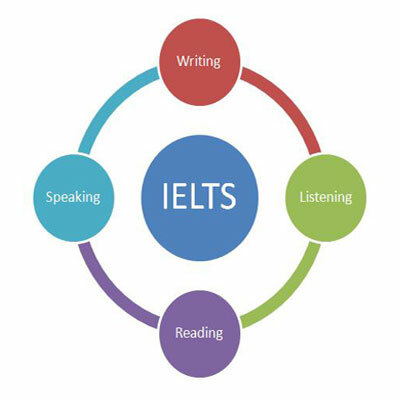 The reading paper in IELTS Exam contains three sections which comprise a variety of question types such as multiple choice, short-answer questions, identifying information, identifying writer’s views, completing a summary using words taken from the text, labeling diagrams, and matching information/headings/features in the text/sentence endings. In this section, for every incorrect spelling and grammar, you will lose marks, so the test takers should be careful when writing down their answers. The Writing paper in IELTS Exam consists of two tasks. Where the test taker should complete both the tasks in 60 minutes. In task 1 the test taker should write at least 150 words in 20 minutes and in task 2, test takers should write at least 250 words in 40 minutes. If the answer is too short or does not relate to the topic, the test takers will be penalized. And test taker should not use notes or bullet points, they should write answers in full sentences. The Speaking Test is a face-to-face interview between the test-taker and examiner. It comprises of three sections. In the first section, the test takers may be asked about hobbies, interests, reasons for taking IELTS exam as well as other general topics such as clothing, free time, computers and the internet or family, and it lasts for 4 to 5 minutes only. In the second section, the candidate has to speak about the given topic after preparing for one minute on a given topic. And the third section involves discussion between the examiner and the candidate, generally on questions relating to the theme.